Select your date and complete the Oak Park Village application and petition. In order to get the recycling, compost and landfill bins from the village, complete the village’s Green Block Party Request Form. IMPORTANT: To select one of the Green “Show & Tell” events for your block party listed above click here. Note: Applications for block party “show & tell” events offered through Green Community Connections are closed for the 2018 season. You can sign-up for the 2019 season (May – Sep) in this form, and we will contact you in the spring. Thanks for your interest! For more information about planning a green-themed show & tell event for your block party call or email sally@greencommunityconnections.org or 773-315-1109. Turn everyone on your block into a treehugger with a tree-tagging activity for all ages to identify your parkway trees and calculate their value. See “How to” sheet attached, compliments of Mary Chris Jaklevic! Share what neighbors are doing to conserve water and prevent flooding, like installing rain barrels and rain gardens. Have a garden walk to feature edible and native gardens on your block. Consider a home grown food exchange. Invite the OP Library’s Book Bike to visit and/or visit the “Little Library” on your block and have a book exchange. Register voters, share favorite ways to be engaged in civic activity/advocacy. Set up an outdoor theater and show a movie at your block party. Visit the beekeeper or chicken farmer on your block or invite someone to visit that can talk about the ups and downs of beekeeping and raising chickens. Progressive dinner or tasting pot luck/share dishes from different ethnic and cultural groups. We look forward to lots of creative DIY green block parties. Please share your stories and photos with us: sally@greencommunityconnections.org! Populations of monarchs have declined 90% in the last 20 years. The U.S. Fish and Wildlife Service is evaluating the status of the monarch butterfly for listing under the Endangered Species Act. It turns out that urban & suburban areas are the monarch’s best hope for survival. We can help save the monarch by providing “pockets” of habitat in every park, school, congregation and yard, whether large or small. Faced with the possibility of extinction of this beloved species, communities locally and nationally are mobilizing to increase monarch habitat. A group of partners are launching an Oak Park & River Forest area campaign to help make room for nature. For more information call 773-315-1109. Smart Mowing — Adjust your mower’s cutting height to at least 3-inches to maintain a taller grass blade. This increases food production for stronger roots and helps shade out weeds. 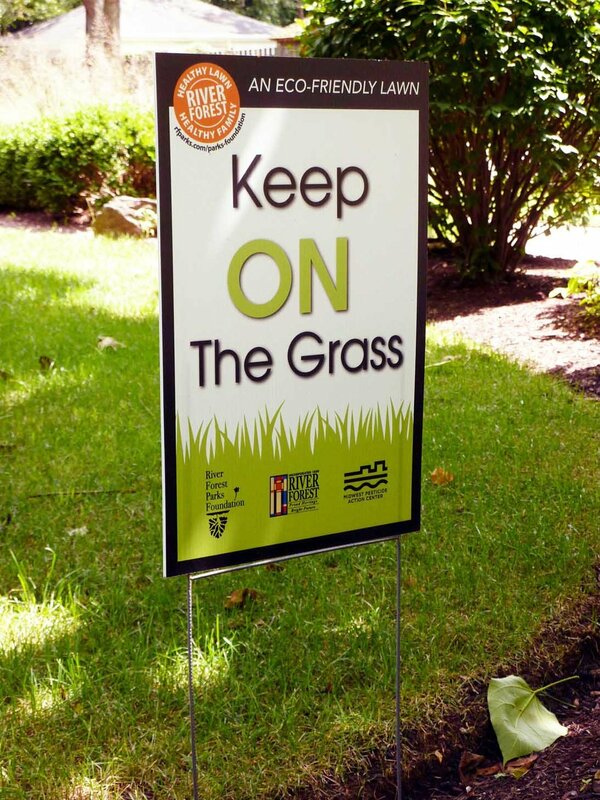 Clippings are integrated into the lawn to recycle nutrients and add beneficial organic matter. Smart Watering — Organic lawns only need 1-inch of water per week. Home Composting — As easy as recycling, learn how to capture lawn, garden and kitchen organic matter with affordable composting systems. For River Forest: http://vrf.us/take-the-pledge For Oak Park: learn more here. The Green Guides program is being developed by PlanItGreen, and River Forest and Oak Park sustainability organizations in response to a need to share, at the neighborhood level, the many sustainability resources available to our communities. Green Guides are not expected to be experts, just to have a willingness to connect neighbors to already existing opportunities and resources. PlanItGreen will provide a quarterly newsletter, materials, resources, talking points, and more for Green Guides to use in getting the word out to your neighbors. Residents who wish to serve as a Green Guide are asked to choose the block(s) or building that they would like to cover. You decide how best to connect to your neighbors (email, phone, in-person). Make a big impact with little effort! Connect with the resources you need to answer your neighbors’ questions.